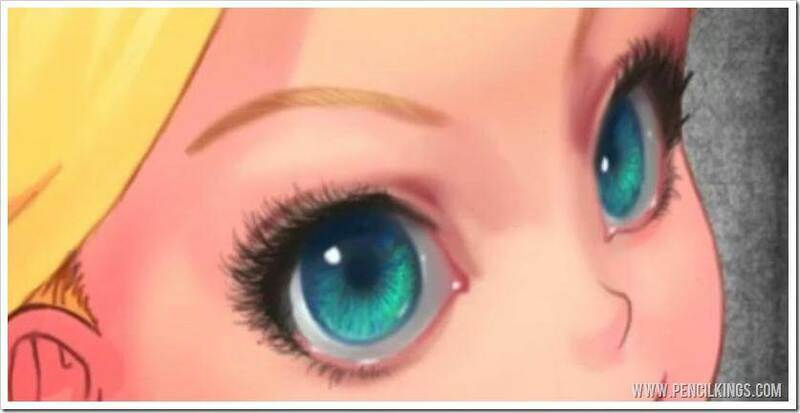 In this fantasy art Photoshop tutorial, you’ll learn how to paint incredibly realistic eyes for an Alice in Wonderland painting. 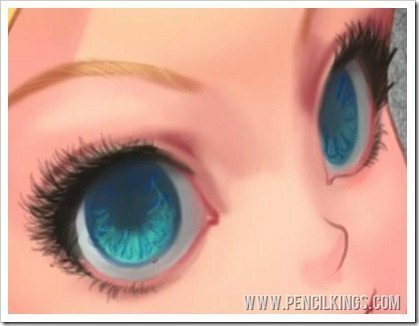 Now you’ve added some subtle shades and areas of color value to the eyes, you’re ready to start adding some detail to really make these features stand out from your painting. The eyes are often the most important part of any painting and the area that viewers zoom in on. So, taking the time now to get these features looking awesome will make a huge difference to your finished painting. 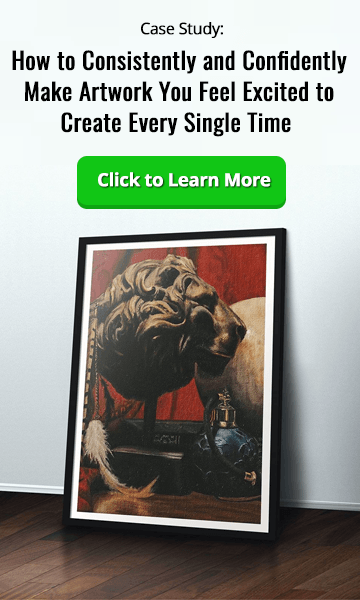 In this lesson, you’ll be using some smaller brush strokes than before and learning how Photoshop’s Smudge Tool can help you achieve some amazing effects. 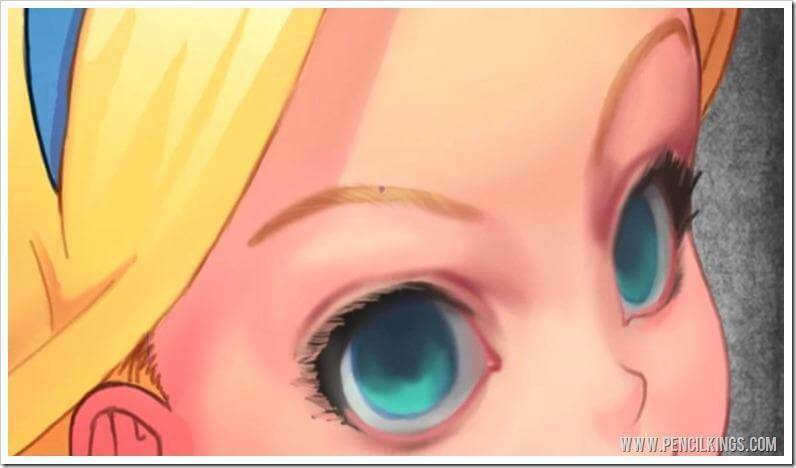 Before we move on to the eye itself, let’s just add some detail to Alice’s eyebrows to make them look even more realistic. First of all, blend out some more of the line art if you need to, and then we’ll start adding some detail. You can do this by selecting a small brush, then picking up some of the highlighted skin color, before applying short strokes to the eyebrows that follow the shape. Your eyebrows are made up of lots of small hairs, so we want to suggest this by adding in some strokes that look as if these hairs are catching the light. There will also be some shaded areas, so use a darker color and add some more lines on top of the lighter ones. We don’t need to go too overboard here – we’re just aiming to create an impression of the small hairs in each eyebrow. When studying our fantasy art Photoshop tutorial, feel free to use reference pictures if you’re unsure of how the eyebrows look when viewed close up. Because the eyes are such an important feature, we really want to make them pop in our painting. 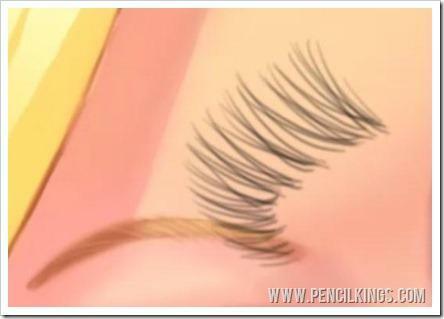 The first stage in doing this is to finish off the eyelashes by adding more detail. Follow Sycra’s example and, using a small brush, draw in a series of small curved hairs that follow the shape. Note how some lines cross over each other and how the hairs become almost like a ‘U’ shape as they get closer to the bridge of the nose. You won’t always need to add so much detail to the eyelashes in your other paintings, but in this instance, Sycra thought it’d be a good look. So, go right ahead and add those lines and use a reference pic if you’re unsure of how the eyelashes should look. Use shorter and longer lines to add variation and don’t forget to add some shorter lines to the bottom of each eyelid using a slightly lighter color. Once you’re done working on these, it’s time to start adding some more details to the eyes themselves. 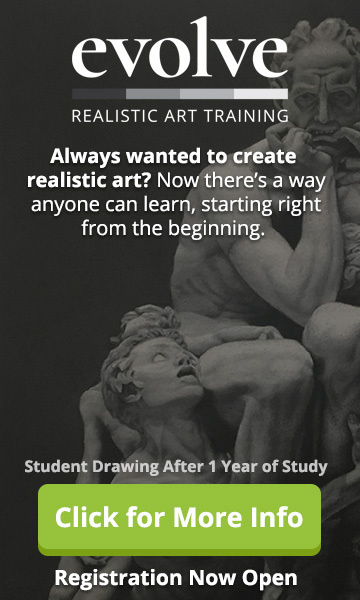 We’re going to be using a similar technique and taking a small brush to make short strokes that follow the form. 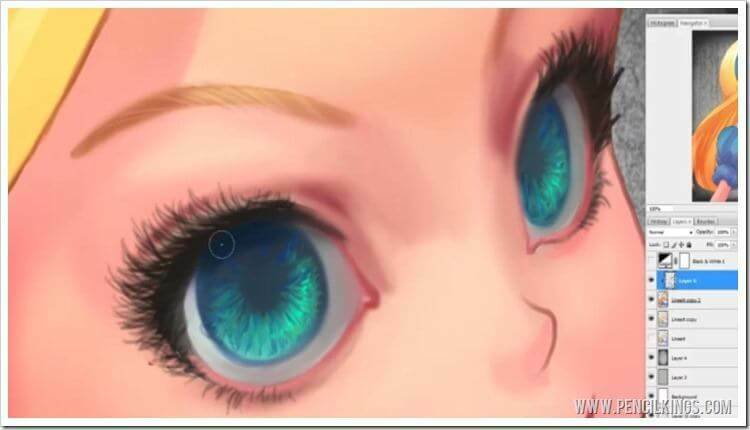 Those of you who’ve seen Sycra’s video series on how to draw an eye will remember how the light source hits the iris and is reflected back off it. If you haven’t seen the video or need to refresh your memory, you can always use a reference photo to help you out. You need to add lots of subtle variation to make the eyes stand out in this fantasy art Photoshop tutorial- blues, greens and grays. Draw each brush stroke as a curved ‘U’ shape which follows the contour or the iris and remember that this is a 3D object. Keep going until you have lots of brush strokes of various color sitting on top of each other. These are small details, but they’ll make a huge difference to your finished painting. Use darker tones for the eye on the right-hand side because this will be in shadow. Next, it’s time to discover Photoshop’s Smudge Tool and see how this can be used to create even more subtle blends in your painting. Select this from the Toolbar, and then turn off the ‘Sample All Layers’ option in the top menu bar. Now, using the Smudge Tool, start blending some of those differently-colored lines together to give added variation. You don’t need to blend everything – just certain areas where you think it’ll work nicely. Once you’re done, go back to your Brush Tool and add some short lines in the bottom part of the iris to represent highlights. When these are finished, go back in with a larger brush to strengthen some of the shaded parts in the iris if necessary. 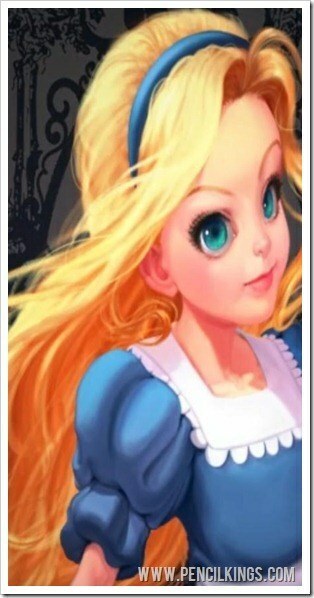 We really want these eyes to pop in our painting, so to do this, create a new layer on which to work. That way, you’ll always have the layers beneath to go back to if you make a mistake. Here, we’re looking to add highlights to really make these features stand out, so taking an almost white color, add a highlight to each eye. Remember, the highlights won’t appear in shaded areas, so the area of dark shadow at the top of the iris will cut the top of the highlight shape off. Still using an almost white color, add some highlights to the bottom of the eye so they appear to glisten. You can also add a little bit of this same color to the side of the eye. If you feel you’ve gone a little overboard with this, you can simply pick up the darker color of the eye beneath and blend this out a little. Once you’re finished, merge this new layer with the layer beneath. 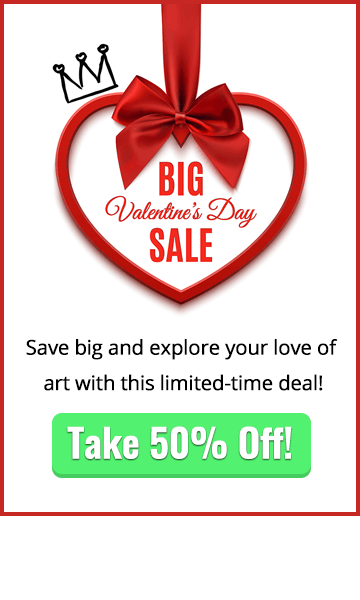 Compare this new version of your painting with the previous one and you’ll see how all those little details you’ve added have made a big difference to your painting as a whole. We hope you’ve enjoyed this fantasy art Photoshop tutorial on how to add details to the eyes. Next up, you’ll be learning how to add details to other facial features such as the nose.